November in the Rocky Mountains usually means snow. These 4 cowboys are set up in their line camp to retrieve cattle that were missed during the Fall round-up and to mend any fences in need of repair. It is critical to finish their task before winter becomes too severe. 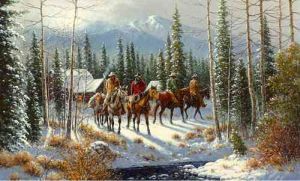 A warm fire and hot coffee await them upon their return, but for now they have a job to do as they ride "Out on the Trail."